Have you ever thought of Fansipan trek 1 day? It’s perfectly fit for those who don’t have much time for long day trekking or don’t want to overnight on the mountains. We haven’t talked much about it, so maybe for you it’s a vague image. Therefore, today we all discuss it on how to go on Fansipan trek 1 day? Or what should you notice with Fansipan trek 1 day? 1. How to go for Fansipan trek 1 day? Self trekking or booking tour? You might be feel like going for a self trekking Sapa to get great experiences; however, in this case I don’t recommend it. You totally should go Fansipan trek 1 day with a professional local guide. There are several reasons why you should do that. First of all, without guide, you can’t do it in one day. A local guide knows every corner of the trail the most. He can guide you to go the shortcut which helps you to gain the peak faster than usual. Plus, you also can avoid getting lost and wasting time on checking the map. In case of not being able to find the right way to get back or to keep moving, you might be stay overnight in the mountain without having prepared for that. A little difficulty may appealing sometimes, but don’t put yourself in inconvenient situation while enjoying Fansipan trek 1 day. One thing that encourages you to go Fansipan trek 1 day with a guide is that you will have interesting conservations with local people. 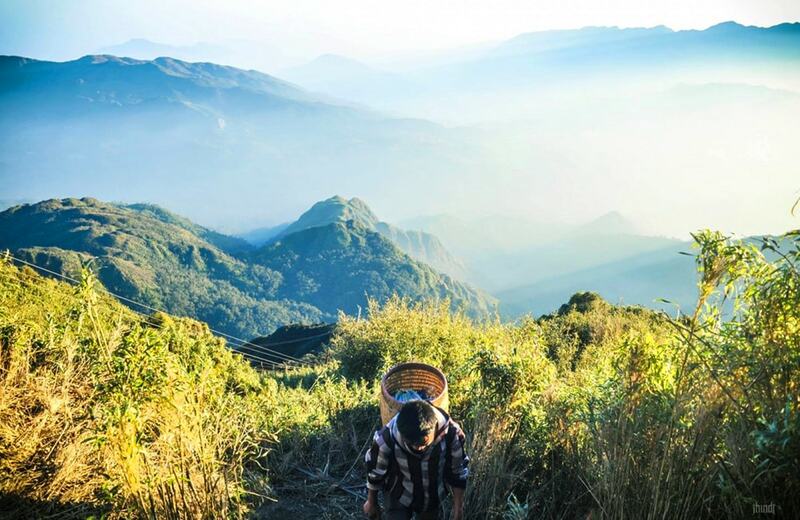 A guide can tell you anything about Sapa, about their people, their life,… You will never get bored with his stories. 2. Where do you find a local guide for Fansipan trek 1 day? The easiest way is to ask your hotel or homestay. They can offer you the experienced local guide with about 35$. You can totally trust your hotel. Otherwise, you also can prebook a tour of Fansipan trek 1 day at a prestigious travel agency. With a tour, you also receive other services like transfer car, entrance and permit fee. I recommend you to find a tour on Booking or Agoda because they have wide range of choice for you. In addition, don’t forget take a look at passengers reviews before pay for a tour. 3. How is Fansipan trek 1 day? You should begin at early morning but not too early, after breakfast is appropriate. The first part of the trail is quite easy, which helps you to digest your food. You just need to walk through largely flat forest with some lovely streams. There are also up and down but it is still at easy level. Such an smooth start of Fansipan trek 1 day! The next route is more vertical and monotonous. At this stage you need to stay focus and keep your mind strong if you don’t want to give up. My friends in their Fansipan trek 1 day were all distressed by the toughness of the trail. They had to speed up to finish in one day and no one felt fit enough for 6 hour ahead. One of them gave up, even though she tried to push herself to catch up with the team. She joined another group who were going down and waited for the rest at the start point. You may not imagine how hard it is until being into this situation. Tough trail with steep uphill and the rush of time can beat you in any second, so prepare yourself with Fansipan trek 1 day before getting involved in it. The higher you climb, the tougher the path is. You can be easily slipped while trying to climbing high platforms. Along the way you can meet many local people passing for working. And you might wonder why they can move so fast and easily like that without any support. This is because they climb everyday in order to work. You are near the end of Fansipan trek 1 day. The whole route will finish when you see the Vietnamese flat sticking out from the rock. If you struggle a lot to gain the peak, you might feel emotional and so proud of yourself. From the peak you can’t observe the valley because all are obscured by the cloud. You should take your time to rest a little bit before heading back. However, the way back might be faster. They help to protect your feet and to avoid slipping. Wearing running or mountaineering shoes is a good idea. This is because these shoes are designed with proper sole for intensive activities. And your feet won’t hurt or get lesions. The heavier you carry, the more stamina you might lose. As I said before, Fansipan trek 1 day requires a high level of endurance, so saving your energy helps you finish this tough journey more easily. You should pack essential things like food, water, first-aid kit. If you go in group, there is no need to bring your own camera, one or two for a group. The weather never always supports you on the way of Fansipan trek 1 day. There will be foggy or rainy day. They key is that you should keep yourself dry and warm so water proof clothes are the great idea. Moreover, you also should prepare a water-proof pack to keep your things intact. Maybe you can bring along a little snack or energy bars, but you definitely have to carry lot of water. Bring more than you need as usual. The trail of Fansipan trek 1 day deprives you lots of sweat and energy. And if you want to keep focus and finish this route you have to compensate what your body lost. Overall, I’m sure that Fansipan trek 1 day is more difficult than you expected. Even very fit people find it challenging somehow. Therefore, if you don’t want to lose the game, take into account my advices above, I hope they can help you in some ways. And finally, Fansipan trek 1 day is worth for the feeling of satisfactory and price.